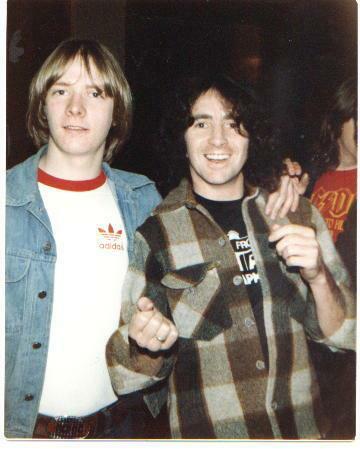 Hello Paul, thanks a lot for sharing your story with AC/DC. 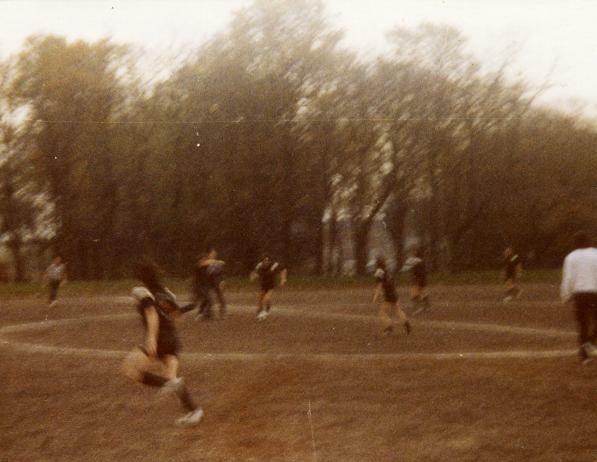 It's a real pleasure to discover all of these photos after 32 years. Why did you decide to release them today for fans ? I was contacted by a friend of a friend who was a big AC/DC fan whome I had sent some of my photo's to a few years ago and he said that he had seen a photo on an ac/dc face book website celebrating 40 years of the band and said he was sure it was me in the photo, so I checked it out and sure enough it was me with Angus outside the Albany hotel in Glasgow back around 78 or 79. 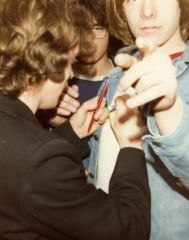 So I dug out some of the old photos and uploaded a few and I was pretty amaized at the response from other fans so I uploaded some more. 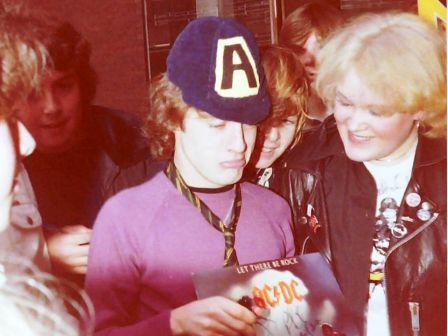 How and when did you hear about AC/DC for the first time ? It was back in 1977 a school friend played a tape of Let There Be Rock which blew me away and he also told me that the lead singer use to live just a few hundred meters from my house before imigrating to Australia, this interested me to think that the lead singer of AC/DC originaly came from Scotland so when I went to see the band for the second time which would have been november 78 myselfe and a couple of mates decided to try and meet up with the band at their hotel and get some autographs. 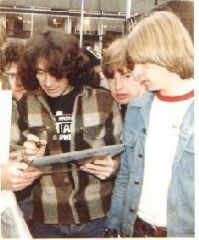 Bon was the first one we got to meet as he checked into the hotel and I asked him if he originaly came from Scotland and he said "yeah" I said where in Scotland and he said "I think it was a plece near Forfar" well this blew the theory that he came from just up the road from where I stayed in Glasgow. 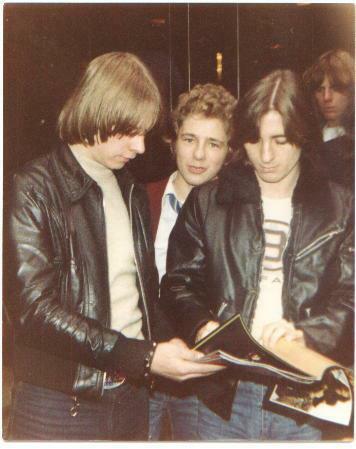 I mentioned this to another fan who was there, I said I was told Bon came from Glasgow and the fan said, no, no, its Angus and Malcolm who come from Glasgow. I went what! you mean 3 of the band originaly came from Scotland... 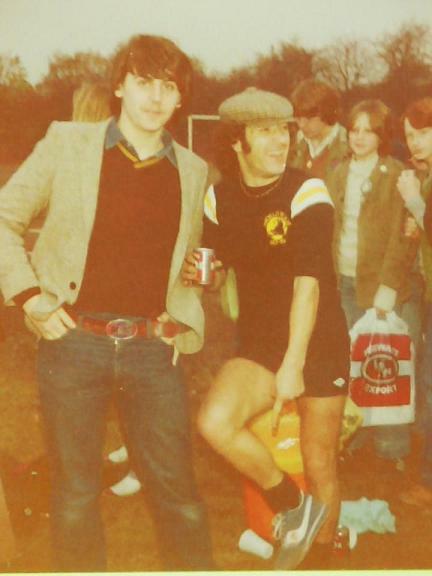 When I finaly met Malcolm he confirmed it and that he came from Cranhill which is where I lived and he even went to the same primary school as I did . 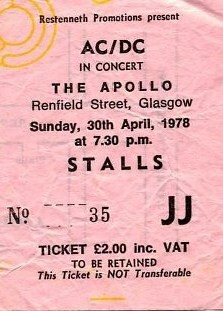 Can you tell us about the concert at Glasgow on April,30th 1978 ? do you have any memories of filming? How was the atmosphere ? 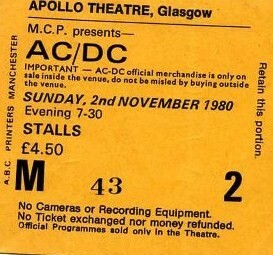 That was my first AC/DC concert and Im sure that concert was the one recorded for the live album If You Want Blood because I remembered the guitar lead buzz at the begining of Riff Raff which was the opener and when I was having a chat with Malcolm I mentioned to him that I thought a lot of the album was taken from that concert and he told me that the whole album was taken from the Apollo concert apart from one guitar solo on one of the tracks which was either A Whole Lotta Rosie or Let there Be Rock which was taken from the Hamersmith Odeon apart from that he said the whole album was from the Apollo. Do you know I have very little recolection of the filming as I was so engrosed in the atmosphere, the place was absolutely bouncing and I was doing a lot of air guitar playing which I must say I was pretty god at. As a fan, what was your relationship with the group, which member was the one most easy to go with ? I only met them breifly when they would be either checking into the hotel or coming back from a sound check or the gig its selfe but I did manage to spend some time chatting to Malcolm in the Cabin bar which was attached to the Albany hotel in Glasgow. 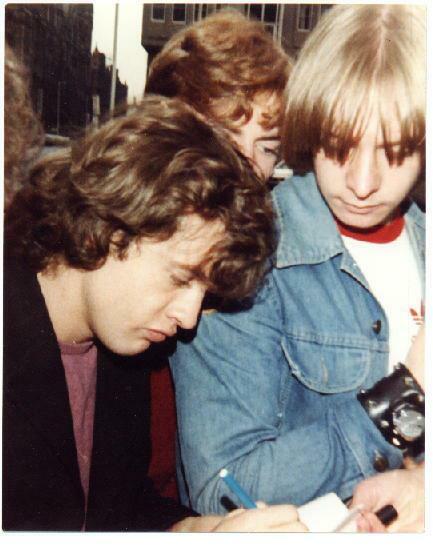 A few of us went in to see if any of the band members were it and Malcolm was sitting with a couple of roadies so we asked him if he would come over and sign a plastic carrier bag and he came over and sat with us signed the bag and had a chat and a drink. I asked him what he wanted to drink and he said a "pernod and black currant" and I said are you kidding? 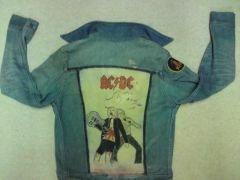 I thought you rockers drank whisky to which he just laughed. I also asked him of his memorries of living in Cranhill, he told me he went to Milncroft primary school, that he use to play football for the school team and he even said to me " do you remember the old school anthem" and he proceeded to recite the old song and would you beleive it the opening line is, School that is set on a hill WE SALUTE YOU. I also asked him if it was true that the song "The Jack" was about how the band use to practise in a barn and these 2 girls would come round to watch and ended up giving them all a doze of the clap, which he confirmed was true. Malcolm was realy down to earth. 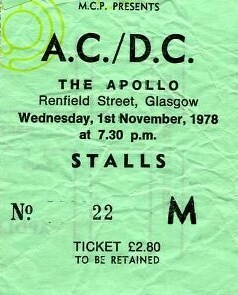 Angus was very quiet and nothing like the crazy on stage guitarist. 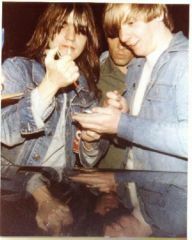 I remember we met up with him in the Albany hotel on the Back in Black tour and he just sat down at the table with me and a couple of my mates when a crowd of fans when were waiting out side spotted him thru the window and the all came rushing in and while Angus sat signing autographs some one stole his lighter off the table and when he noticed it was missing he asked if anyone had seen his lighter and I pipped up and said thats pretty low stealing the guys lighter and then some one at the back said, "oh is this it here Angus" and handed it back to which Angus said cheers mate. 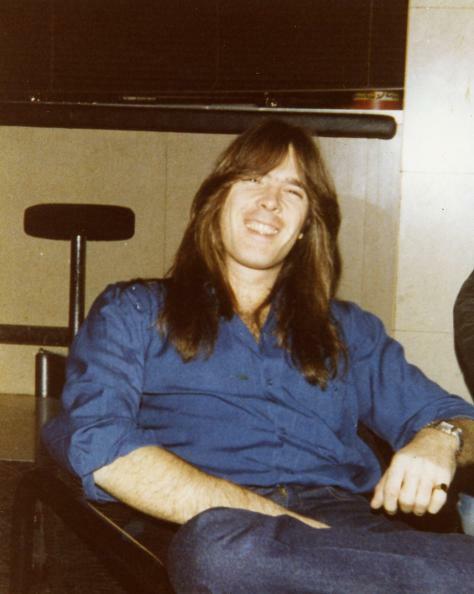 Cliff Williams was a real nice guy to, I remember asking him how the band were coping with the loss of Bon which he said they were devestated found it realy hard to take and still could'nt beleive he was gone, he also said they were realy pleased with Brian and got on realy well right from the start. 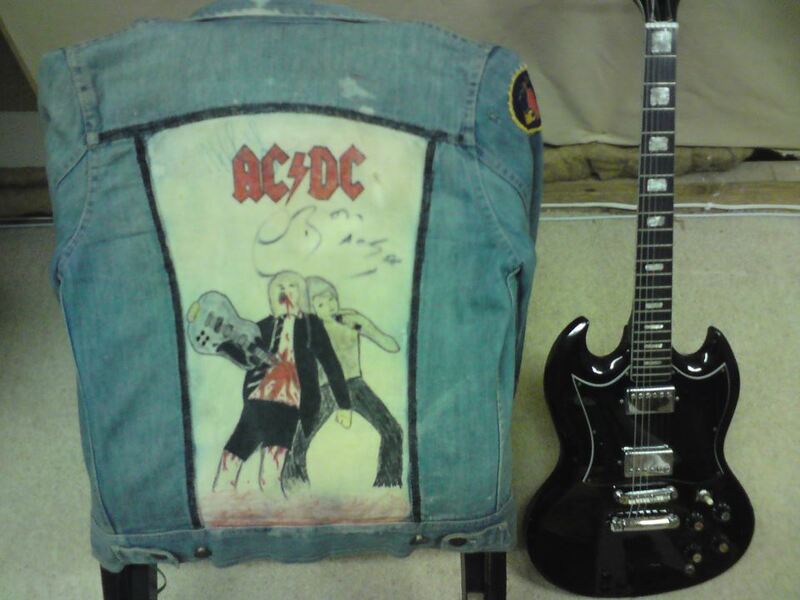 I asked him to sign a photo I had taken of him on the previous tour and he said "jeez I've still got that jacket". 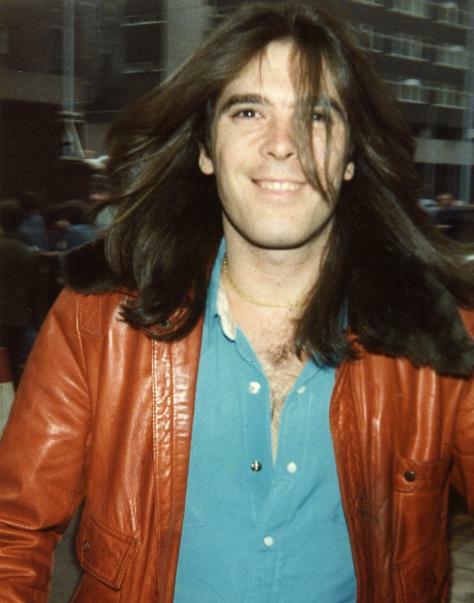 I only met Phil the once, we were standing outside the hotel entrance waiting for any band members to appear when I spotted Phil thru a window standing in the hotel foye with a roadie so I chapped on the window to get his attention and waved him to come out to which he thumbed and mouthed "F### off" but then laughed and came out a couple of minutes later and signed autographs for us . 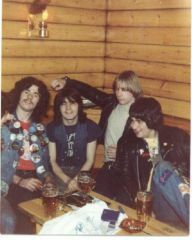 The band were all nice guys and would accomodate you if they had the time. 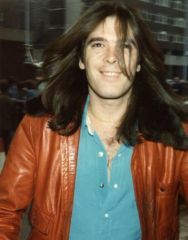 One of your photo was published in the French magazine Best in sept. 1980, were you aware of this publication at that time ? 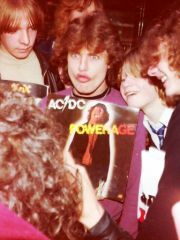 No I was not, but I distinctly remember the photographer was French as he was asking us to stand with Angus and hold album covers and programs while he took photos, that photo from the magazine a guy behind me is holding the Powerage album in front of me while the tour program that Angus is holding is actualy mine. 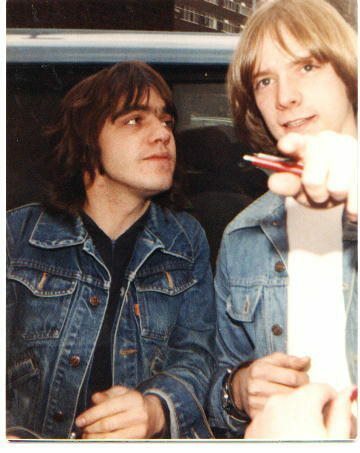 How did you react to Bon's death? 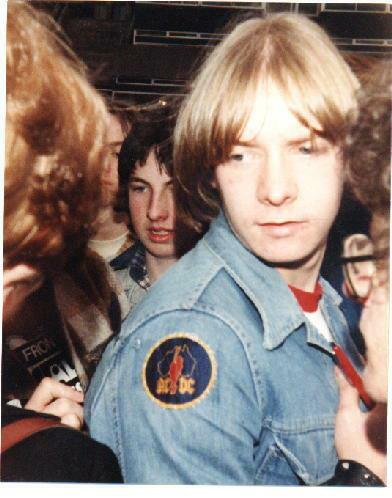 What did you think of the choice of Brian in 1980? and now ? 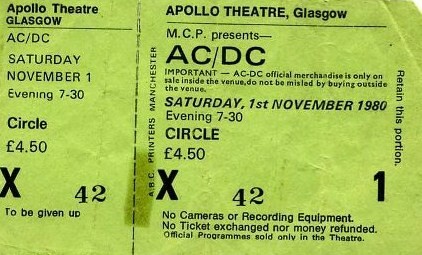 I was absolutely gutted, I remember I just got home from colledge and heard about it on the news, I went into my room and just lay there listening to AC/DC records for hours and I actualy cried when I listened to "Ride On" that just cracked me up, I lived and breathed AC/DC at that time and had everything they ever done, my bedroom had AC/DC posters and photos of every kind on the wals and ceiling. I even bought an SG copy the same colour as Angus and learned to play all their songs and even to this day there is a lot of Angus influence on the way I play guitar. 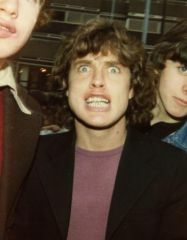 Brian was a brilliant choice and the Back in Black album for me is still the best album he has done with the band to date. 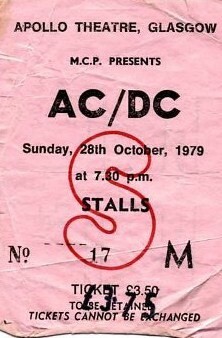 You saw AC/DC live in in 1978-79-80. 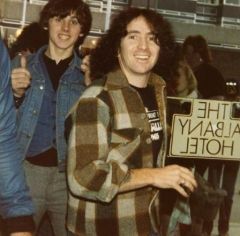 Did you meet them after on other tours ? 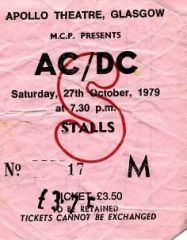 Unfortunately I have never seen the band live since 80 and the last album of theirs that I bought was, For Those About To Rock I have since got Black Ice but nothing else as my musical tastes went through some changes. I still listen to AC/DC but its mainly everything up to and including Back In Black. 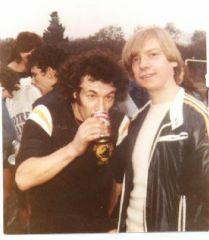 the photo of Brian Johnson after a soccer game is awsome, can you tell us more about that moment ? Were all AC/DC members playing ?? where was the stadium located ? 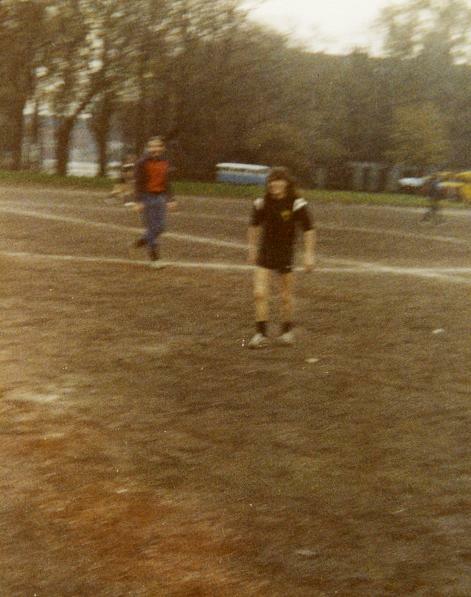 Yeah the band must have decided they fancied a game of footy and booked a small practice pitch down near Glasgow Green. 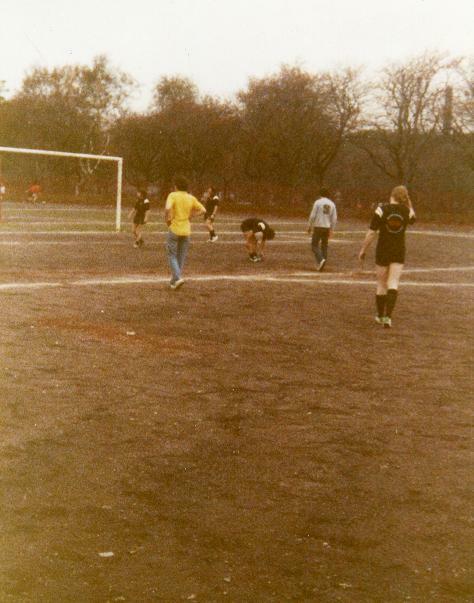 They emerged from the hotel wearing shorts and what looked like tour T-shirts and the jumped into several 4x4s so we set off following them from the hotel and when we got to the pitch they set up a five a side game with the road crew. Im not sure but I only know for certain that Malcolm and Brian were there and the other photos I took of them playing are rather blurred as they were runing about. I remember one of the crew came over and said the needed one more person for the game and one guy wasted no time in volunteering but after he walked over to the crew he came back over and was rather pissed off that all the wanted him for was to be the refferee and not to play football, that was funny. Brian was quite a character and was getting roughed up by the road crew during the tackles and his reactions were realy funny,, he was a nice guy. 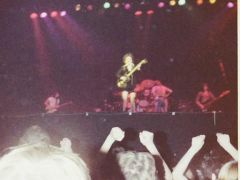 During their concert in Glasgow, the boys used to play Scottish theme "Fling Thing". 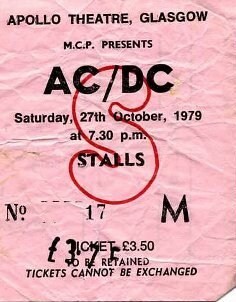 Do you remmeber this ? Were you feeling special at that time? 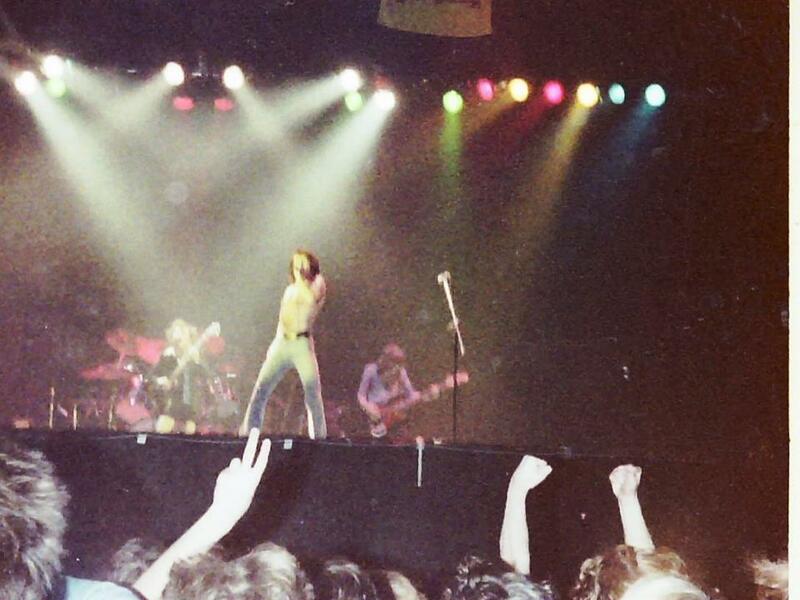 had AC/DC kept a genuine Scottish heart though they had moved to Australia ? 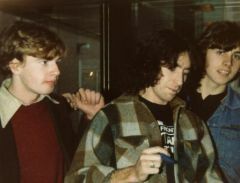 I did'nt recognize fling thing when they first played it as I only managed to get hold of the track later on an import album but its a great tune and I still play it on my guitar. The band are very proud of their scottish roots and if you look at the photo I took inside the Apollo, up in the lighting rig you can just see the bottom of a lion rampant flag. 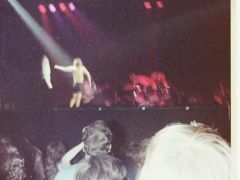 Durring the concert 3 massive Lion Rampant flags drop down from the lighting rig and Angus weaves in and out them while playing one of his solos, and one time the band came back on stage for the oncore wearing Scotland football strips and kicked balls into the crowd, I think this was just before Scotland were about to take part in the 1978 world cup. And there is the un mistakable "Its A Long Way To The Top If You Want To Rock n Roll" with the bagpipes, I mean how many rock bands can get away with that and how cool did it sound.